[S61] Upper Beaconsfield History Archive ,"Ken Hudson's memories of his time as a vestryman." [S59] John Milligan, Book: The History of St. John's Anglican Church, Upper Beaconsfield. [S11] Newspaper - Argus 8 Dec 1950, p19. Memorial* Anglican Church, 55 Peel Street, Berwick, VIC, Australia. 24 Nov 1938, COLE.—Friends of the Rev. A. J. COLE are respectfully informed that his remains will be interred In the Berwick Cemetery, after a short service in Christ Church, Berwick, beginning at 3 p.m. THIS DAY (Thursday). COLE.—Berwick Lodge No 359, A., F. and A. Masons of Victoria. - Officers and Members of above Lodge and Craft in general are informed that the remains of their late esteemed Bro. the Rev. ALFRED JAMES COLE will be interred in Berwick Cemetery THIS DAY (Thursday, 24th November). Service in the Church of England at 3 pm. Wor. Bro. J. S. LOVERIDGE W.M. [S1] Registry of Births Deaths and Marriages Pioneer Index Victoria 1836-1888 "reg Gard." [S11] Newspaper - Argus 24 Nov 1938, p10. [S11] Newspaper - Argus 13 Jul 1910, p1. [S11] Newspaper - Argus 23 Nov 1938, p14. [S11] Newspaper - Argus 6 Nov 1939, p2. Walter Driffield McMinn enlisted as 2nd Lieutenant with the 5th Battalion, 16th Reinforcement on 12 Jun 1915 while he was living in Hawthorn and working as a traveller. His unit embarked from Melbourne on 1 Apr 1916 on board HMAT A23 Suffolk. He was promoted to Lieutenant and returned to Australia on 5 Apr 1918. Death-Notice* 20 Apr 1978 McMINN.—On April 19th W. D. McMinn, at Noble Park, late of St Georges Rd., Upper Beaconsfield, husband of the late Myrtle Louise, late of Orford and Hobart, Tasmania. No flowers or condolences by request. McMINN, W.D. — Loving stepfather of Alex (dec) and Jean and loving grandpa of Alex and Marjorie. 21 Jul 1937, Parties For Travellers: Since their return to Hobart after a most interesting trip abroad for nearly 18 months, Mr. and Mrs. W. D. McMinn have been entertained at several parties. Mrs. E. A. Rogers invited a group of friends to tea one afternoon when Mrs. McMinn, and her sister Miss Mollie Glasson, of Ballarat, were present. Mr. and Mrs. McMinn were special guests at an evening party given by Dr. and Mrs. H. W. Sweetnam, at their Sandy Bay home, on Thursday, when card games were the order of the evening. The guest of honour wore an attractive frock in one of the new scintillating materials, in a lovely shade of blue embossed with silver flowers; the fullness of the skirt came from the waist, and the bodice was designed with a cape effect A long sleeved frock of flowered georgette was worn by the hostess, the effective patterning being in shades of pink on a black background. Others at this enjoyable party were: Major and Mrs. H. N. Boyle, Dr. and Mrs. Frank Fay, Mr. and Mrs. Henry Allport, and Mr. and Mrs. W. T. Crosby. John Colin McDonald, who appeared in the Hobart Police Court yesterday on a charge of breaking and entering and theft, was committed for trial at the next sitting ot the Criminal Court at Hobart. Accused, who was represented by Mr. F. C. Mitchell, was charged with having at Hobart between April 7 and 12 last, broken and entered the house of Walter Driffield McMinn, and stolen a quantity of goods valued at £40. He pleaded not guilty. The Police Magistrate (Col. J. P. Clark) presided and Detective-Inspector R. W. Fleming prosecuted. 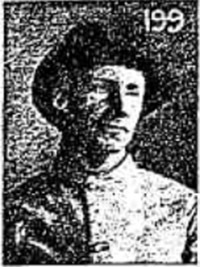 Walter Driffield McMinn, army officer, Red Chapel Ave., Hobart, said accused on two occasions had been employed as a gardener by witness. Witness was absent from his home between April 7 and 12, and on returning found it had been forcibly entered and a quantity of goods stolen. Property comprises a charming Weatherboard Home set in a beautiful old garden of many attractive trees and flowering shrubs. Home has 3 bedrooms, lounge, diningroom, &c. and includes WW carpets, curtains, ELFs and sun blinds. Sweeping driveway leads to garage and shedding. Mains water connected. Terms: 10 % deposit, ba. 60 days. Furniture includes Six Antique Chairs and Tables, early Victorian Buffet, Ellingsen Rolltop Desk, Bedroom Suite, Pictures, Books, Edwardian Whatnot, Bow-fronted Chest of Drawers, Mahagony Card Tables and Color TV. [S35] Probate Records, PROV (Public Records Office Victoria), VPRS 28/P9, unit 5; VPRS 7591/P5, unit 1. [S33] Australian Government: http://www.naa.gov.au/collection/search/index.aspx, Military File, 2nd World War. [S11] Newspaper - Argus 3 Jan 1923, p1. [S5] Registry of Births Deaths and Marriages Death Index Victoria 1921-1985 "reg. Beaconsfield." [S185] Property Titles. ; PROV (Public Records Office Victoria), C/T 4392-348 - Estate of Colin Wright to Walter Driffield McMinn of St Georges Road Upper Beaconsfield Retired. [S66] Berwick Shire Rates, 1870-1965 Note in rate book #3322 28 Feb 1962 Smith & Emmerton P.P £6,000 (Assistance granted HSH: 8/1/1964) NAV now £127. [S16] Newspaper - The Age 20 Apr 1978, p23. 4-618-A McMinn Walter Driffield M 11/08/2008 3692. [S14] Newspaper - The Mercury (Hobart), 14 Jul 1937, p4S. [S14] Newspaper - The Mercury (Hobart) 21 Jul 1937, p3S. [S14] Newspaper - The Mercury (Hobart), 6 Jan 1940, p12. [S14] Newspaper - The Mercury (Hobart) 14 Feb 1940, p5. [S16] Newspaper - The Age 22 Nov 1978, p34. Alexander Henry White (1882-1915), army officer and maltster, was born on 9 May 1882 at Ballarat, Victoria, fifth child of Alexander White, a maltster from Scotland, and his English wife Eliza, née Collison. Educated by a private tutor and at Grenville College, Ballarat, Alexander followed his father and brother into the malting business, joining Wendouree Malt House. He became a citizen-soldier in 1899: his 'whole heart and soul was in his military work from the time he joined the old (Victorian) Mounted Rifles in Ballarat after leaving school'. Commissioned in March 1904, he gained steady promotion and by 1914 was brigade major in the 5th Light Horse Brigade. On 22 October 1913 he had married Myrtle Louise Glasson at St Peter's Anglican Church, Ballarat. Transferring to the Australian Imperial Force on 21 September 1914, White was given command of the 8th Light Horse Regiment. He was promoted lieutenant-colonel on 1 January 1915, eight weeks before the regiment embarked for Egypt as part of the 3rd Light Horse Brigade. The unit landed at Gallipoli on 21 May to be employed as infantry. White was wounded in action on 27 June, but resumed command on 4 July. At 4.30 a.m. on 7 August 1915 the 3rd Light Horse Brigade mounted a bayonet assault on the Turkish trenches at The Nek. Seven minutes earlier, due to an error, the preliminary bombardment had ceased, allowing the enemy to prepare for the attack. White led the first of his regiment's two waves, but was shot down a short distance from his trench. Of the 300 officers and soldiers under his command, 153 died with him and 80 were wounded within minutes. The charge has endured as one of the best-known episodes of the Gallipoli Peninsula campaign: it was the subject of a painting by George Lambert and the setting for the finale in the 1981 Australian film, Gallipoli. [S55] Adb online, online http://adbonline.anu.edu.au/adbonline.htm, Burness, Peter, 'White, Alexander Henry (1882–1915)', Australian Dictionary of Biography, National Centre of Biography, Australian National University, http://adb.anu.edu.au/biography/white-alexander-henry-9068/…, accessed 28 July 2011. [S185] Property Titles. ; PROV (Public Records Office Victoria), C/T 3880-980 - Keith Frederick Gibbs of "Kardinia" Yarra Glen Farmer. [S185] Property Titles. ; PROV (Public Records Office Victoria), C/T 6683-491 - Keith Frederick Gibbs of "Kardinia" Yarra Glen Farmer. [S185] Property Titles. ; PROV (Public Records Office Victoria), C/T 1840-978 - Keith Frederick Gibbs of "Kardinia" Yarra Glen Farmer. [S185] Property Titles. ; PROV (Public Records Office Victoria), C/T 3880-980 - Alric Oliver Yourn of Upper Beaconsfield Farmer. [S185] Property Titles. ; PROV (Public Records Office Victoria), C/T 6683-491 - Alric Oliver Yourn of Upper Beaconsfield Farmer. [S11] Newspaper - Argus 28 Apr 1954, p7. [S47] Index of burials in the cemetery of Springvale Botanical Cemetery,. Death-Notice* 1 May 2012 GIBBS (Fisher).—Helen Duff. 11.11.1916 - 29.04.2012 Dearly loved wife of Keith (dec. ). Much loved mother and mother-in-law of Peter and Margaret, Pam and Felix Goldschmied, Barbara and Darrell Hardy. Dearest Gran to Katie, Andrew, Antony. Lisa, Jason, Bridget and Matthew and proud Super Gran to 17 great grandchildren. Will be sadly missed Thank you to the staff at Melville Grange for their special care. [S13] Newspaper - Herald Sun "1 May 2012 - viewed online." [S11] Newspaper - Argus 19 Apr 1944, p2. [S11] Newspaper - Argus 18 Feb 1950, p13. Village Bell* Jan 1981 The article reads: Luke Gibbs, his brother, and his mother (who is now around the "Three score years and thirty" mark) came to Dewhurst in 1946. He lived and worked there until the Board of Works took over, and latterly he worked on clearing and levelling for the Board's huge dam. Much of the land as he recalls it was taken up with orchards, market gardens, pasture, and pine plantations, and on the outskirts was bushland. There was still a profusion of wildlife; a gully running up from Gibbs' place to Ladd's, sheltered wombats and helmeted honeyeaters. Ladd Road was only a bush track, until it was formed into a road of sorts in 1947-48, but even then it was inadequate for traffic, and it was the subject of appeals from the Fire Brigade to the Shire, as it gave access to the most difficult part of the Brigade's territory. 1 Dec 1954, UNDER THE HEALTH. ACT No. 3697, Part V, Section 82. [S185] Property Titles. ; PROV (Public Records Office Victoria), C/T 7960-137 - Alfred Luke Gibbs of "Norwood" Dewhurst Farmer (A Queen's Caveat No 138357 had been lodged on 30 Nov 1953 - withdrawn 24 Dec 1954). [S185] Property Titles. ; PROV (Public Records Office Victoria), C/T 8309-079 - Alfred Freeland Gibbs Retired and Agnes Alice Gibbs Married Woman Both of Reigate Ladd's Road Dewhurst - joint proprietors. [S185] Property Titles. ; PROV (Public Records Office Victoria), C/T 7960-137 - Cancelled as to part pursuant to Regulation 12 and Titles issued as set out hereunder on 22 Aug 1961. (Lots 1, 2) - C/T 8309-079 and 080. [S185] Property Titles. ; PROV (Public Records Office Victoria), C/T 8309-080 - Melbourne and Metropolitan Board of Works. [S15] Newspaper - Village Bell "16-1981, p12." [S180] Electoral Roll for Australia, 1980 "Agnes' residence = Albers Road ; Luke's = 12 Albers Road." [S218] Newspaper - The Dandenong Journal (1927-1954) "1 Dec 1954, p19." Death-Notice* 30 Apr 1973 GIBBS. On April 28th Mr Alfred Freeland Gibbs of Stoney Creek Rd, Upper Beaconsfield, dearly loved husband of Agnes Alice, loving father of John and Alfred. Rest in peace. [S65] Ancestry - various indices, Source Citation: Dorset History Centre; Dorset Parish Registers; Reference: PE/WY(HT). Source Information: Ancestry.com. Dorset, England, Births and Baptisms, 1813-1906 [database on-line]. Provo, UT, USA: Ancestry.com Operations, Inc., 2011. Original data: Dorset Parish Registers. Dorchester, England: Dorset History Centre. [S83] Online index to the UK census "1911 census." Fate Effective abroad (still overseas). [S80] Ancestry - Family Tree, mace Family Tree - Owner: vivmace - give marriage date as 6 Apr 1924. [S185] Property Titles. ; PROV (Public Records Office Victoria), C/T 8309-079 - Melbourne and Metropolitan Board of Works. [S185] Property Titles. ; PROV (Public Records Office Victoria), C/T 8080-500 - Alfred Freeland Gibbs Gentleman and Agnes Alice Gibbs Married Woman both of Stoney Creek Road Upper Beaconsfield - joint proprietors. [S185] Property Titles. ; PROV (Public Records Office Victoria), C/T 6791-166 to C/T 8733-938 - Alfred Freeland Gibbs Gentleman and Agnes Alice Gibbs Married Woman both of Stoney Creek Road Upper Beaconsfield - joint proprietors. [S16] Newspaper - The Age 30 Apr 1973, p23. [S185] Property Titles. ; PROV (Public Records Office Victoria), C/T 8080-500 - Agnes Alice Gibbs of Stoney Creek Road Upper Beaconsfield Widow is now the surviving proprietor. [S83] Online index to the UK census "1911 census: Class: RG14; Piece: 3179; Schedule Number: 164." MERRITT, Walter [known as 'Loo' (from Waterloo)]. Private , A Squadron. Born Camberwell, 6/6/78. Station Hand. Single. NOK: Mother, Eliza Merritt, nee Kirkpatrick, 14 Farmer Street, Burnley. 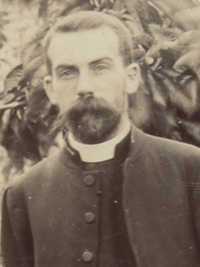 Father: John Merritt. Religion: Roman Catholic. Height 5 feet 8 1/2 ins. Chest measurement 35 1/2 ins. Left Melbourne on the Euryalus, 10/3/00; disembarked Beira, 3/4/00 to join Rhodesian Field Force. Invalided to Australia via Tasmania on the Waiwera, thence to Melbourne on the Coogee, arriving 14/12/00. Discharged 25/1/01. Medal entitlement: QSA and two clasps: tvl/rhod. In 1901 married Elizabeth Hart Gloster, and in 1914 was living in Upper Beaconsfield. He was employed as a locomotive driver. WW1: AIF: Enlisted 4/11/1914 as Private (105), C Company, 3rd Bn. AN & MEF. Corporal 15/5/15. Reverts to Private, 29/9/15, at his own request. Discharged 13/10/16. To enable Walter Merritt, an orchardist of Upper Beaconsfield, to serve with the colors, his wife has been working the orchard. Merritt enlisted in August, 1914, with the Light Horse. When volunteers were called for the expedition to German New Guinea, he transferred to the Tropical Forces, and served 710 days in the German colonies. Early in the campaign he was appointed police master, and claims to have been the first white man to cross a chain of mountains running through the heart of New Guinea. One of his many experiences was administering the oath of allegiance to the natives at Morobi, one of the outstations in the former German colonies. Merritt was a member of the First Victorian Bushmen's Contingent which went to South Africa, where he served for 355 days. At Rustenberg, when on extended scout duty, he was cut off from his party, and was forced to spend two days in hiding. Eventually he found his way to Pretoria, where he again joined the Australians. Later he was appointed despatch rider to Colonel Tom Price, and had many exciting experiences. [S33] Australian Government: http://www.naa.gov.au/collection/search/index.aspx, Enlistment Records for World War I. [S80] Ancestry - Family Tree, Photo of Walter and Elizabeth Merritt, 1901, courtesy Brooke Turner. VPRS 28/ P4 unit 3670, item 636/707. [S185] Property Titles. ; PROV (Public Records Office Victoria), C/T 2097-397 - Edgar Elmore Williams to Walter Merritt of Upper Beaconsfield Farmer. [S185] Property Titles. ; PROV (Public Records Office Victoria), C/T 2097-397 - Walter Merritt to Arthur William Shorthouse of Upper Beaconsfield Coach Driver. also buried in the same grave is Ethel Joy TURNER, service 26 Oct 1942 (no death found in VIC). VPRS 7591/ P2 unit 1179, item 334/573. [S185] Property Titles. ; PROV (Public Records Office Victoria), C/T 2026-186 - Henry Wooldridge died on 11th July 1902 - Probate granted to Perpetual Executors and Trustees Association of Australia Limited - land transferred to Elizabeth Harriet Merritt of Upper Beaconsfield Married Woman - C/T 3829-757. [S66] Berwick Shire Rates, 1870-1965 Still in rate book 1913/14 as Wooldridge Estate. [S185] Property Titles. ; PROV (Public Records Office Victoria), C/T 1154-751 - Elizabeth Harriet Merritt of Upper Beaconsfield Married Woman. [S185] Property Titles. ; PROV (Public Records Office Victoria), C/T 3829-757 - Elizabeth Harriet Merritt to Harry Tassell Signalman and Mary Ann Beatrice Tassell both of 6/4 Barker Street Footscray - joint proprietors. [S185] Property Titles. ; PROV (Public Records Office Victoria), C/T 1154-751 - Frederick Funnell of Upper Beaconsfield Orchardist - C/T 4464-741. [S12] Newspaper - South Bourke and Mornington Journal 21 Dec 1916, p3. 27 Oct 1944, BOMBING KILLS FIVE TASMANIANS IN FLAGSHIP ATTACK. "The Mercury" Special Service. CANBERRA. Thurs. "The damage was confined to the upper deck, in the vicinity of the flagship's bridge, and although only superficial damage was caused to the ship herself the casualties suffered in that exposed position were heavy, in all 19 being killed or subsequently dying of wounds, and 54 being wounded. "Killed.-Lt Henry Brinsmead Bayley, Lt. Ivor Maurice Jones, CPO George Frederick Hutchison, OS Ronald Hocking, AB Francis Gerard Miller, AB Noel Aubrey Rattray. "Died of wounds.-Capt Emil Frank Verlaine Dechaineux, Acting Commander John Francis Rayment. Acting AB Max Buckland, AB Gordon Kenneth Fenton, AB Vincent Leo Hansen, AB John Wilson Hocking, AB Allan Richard Maunsell, AB Richard John Parkinson, AB Frederick Percival Perrin, Leading Seaman Donald Pittendright, OS Christopher Peel Potter, OS Ronald Hamilton Sharpe, AB Francis Frederick Spurr. '*The Royal Australian Navy has suffered heavily in this war in ships and personnel. It is a source of gratification to know that these losses, suffered in all cases in following the highest traditions of the service, have not been in vain. All operations have been leading up to this present situation, where the Royal Australian Navy, in company with our gallant American allies and with the Royal Navy, is in the spearhead of the attack which is inflicting successive defeats on the enemy. "The enemy's blow at HMAS Australia is sobering proof of the constant warnings given to the Australian people that there will be no bloodless paths to victory. Much as I regret the deaths, of gallant Australians and the damage to a fine ship, I point to both as a demonstration that complacency among the Australian people must cease. "Australian fighting men have a hard road to Tokio. Their tasks and their sacrifices must be paralleled on the home front. I call for oversubscription of the Second Victory Loan in the name of these men.". Capt Dechaineux, who was, 42, was the eldest son of Mr L Dechaineux, of Hobart, and chose the Navy as his career in his boyhood. 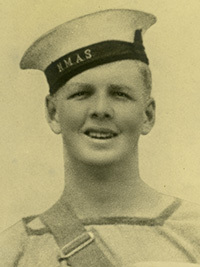 He was educated at the Friends' School, Hobart, and entered Jervis Bay Naval College as a cadet at the age of 13. He married in 1936 Miss Mary Harbottle, of Hobart. One of Australia's most brilliant naval officers, he took command of the Australia in March, and participated in the Hollandia landings, the bombardment of Wakde and Aitape, the landings at Biak, Noemfoor, and Morotai, and the invasion of the Philippines. He was promoted lieutenant in 1924 and commander in 1937. He went to England in 1936. Capt Dechaineux specialised in torpedoes, in which he took the advanced course, and won the Ogilvy Medal for gaining first place in the examinations for torpedo lieutenants at the RN staff college in England. His next appointment was to the tactical division at the Admiralty, where he served until 1940. He then served in command of destroyers overseas until August 1941, and was awarded the DSC for outstanding zeal and devotion to duty. He was recalled to Australia, in 1941 to act as Director of Operations. He held that post until November 1942, when he was appointed to command HMAS Warramunga. He commanded that ship in the Gasmata bombardment in November 1943. The landings at Arawe and Cape Gloucester in December, and the landings at Saidor in January 1944. He was promoted captain in December 1943, and until his transfer to the Australia in March was in command of task force destroyers with Australian and American ships under his operational control. Capt Dechaineux is survived by his widow, a son and daughter. AB Gordon Kenneth Fenton was the eldest son of Mr and Mrs K. B. Fenton, of Claremont. He was aged 19. He joined the RAN on July 13, 1942. AB Richard John Parkinson was the only son of Mr and Mrs R Parkinson, of Moonah. He was aged 23. 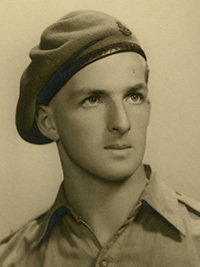 OS Christopher Peel Potter was born in Tasmania, and joined the RAN on Nov. 9, 1943. He had served also in HMAS Allenwood. Roll of Honour MELBOURNE VIC. [S65] Ancestry - various indices, Source Citation: Peter Singlehurst; Naval Memorials in the Untied Kingdom Plymouth Part 8; Roll #: 40465_291219. Ancestry.com. UK, Commonwealth War Graves, 1914-1921 and 1939-1947 [database on-line]. Provo, UT, USA: Ancestry.com Operations, Inc., 2012. [S11] Newspaper - Argus 28 Oct 1944, p2. [S14] Newspaper - Examiner (Launceston), 9 Aug 1926, p1. [S14] Newspaper - Mercury (Hobart), 27 Oct 1944, p2. Note* Robert Steele Scott was born in 1837 at Ardmeen, County Tyrone, in Northern Ireland. In 1858 he came to Victoria where he was engaged in mercantile pursuits for 10 years. After a trip to England he returned to Melbourne and opened a business as an importer. He married Alice Tulloch on 8 Oct 1878 in Launceston. About three years later they returned to Launceston and established an importing business, handling principally hardware. Mr Scott, with Mr M Boland, took the contract for constructing the Launceston-Scottsdale railway. Robert was also a pastoralist at 'Dunedin', St Leonards, for many years. Robert was made a JP in 1890 and was member of the Legislative Council for South Esk from 1899. He was a Benevolent Society supporter, was associated with the National Agricultural Society and director of various companies, including the National Bank of Tasmania, the Launceston Gas Company and the Queensland Insurance Company. He was also a prominent Freemason, being a member of Lodge of Hope for 42 years. He died on 28 July 1924 at his residence, 'Annsbrae', Launceston at the age of 86 and was buried at the Carr Villa Cemetry. 11 Jan 1944, BEACONSFIELD MYSTERY. Man With Bullet Wound in Head. Medical evidence is now definite that Douglas Thompson, 48 years, farm hand of Upper Beaconsfield, who is on the danger list at Alfred Hospital, is suffering from a bullet wound in the forehead. Thompson, who left his employment on Mrs. Beryl Potter's farm at Upper Beaconsfield early on Thursday night last, had a pea rifle with him. He was not seen again unlit late on Saturday night, when he called at a farm a quarter of a mile from his home, and said he had been knocked down by a motor car two days before. [S207] Simon POTTER "visit on 27 Apr 2014." [S64] Archives Office of Tasmania. BDM Index Tasmania. [S1] Registry of Births Deaths and Marriages Pioneer Index Victoria 1836-1888 "two older siblings born in St Kilda 1879 & 1881." [S14] Newspaper - Examiner (Launceston), 20 Dec 1917, p4. [S65] Ancestry - various indices, Class: BT26; Piece: 678; Item: 101. Source Information: Ancestry.com. UK, Incoming Passenger Lists, 1878-1960 [database on-line]. Provo, UT, USA: Ancestry.com Operations Inc, 2008. Original data: Board of Trade: Commercial and Statistical Department and successors: Inwards Passenger Lists. Kew, Surrey, England: The National Archives of the UK (TNA). Series BT26, 1,472 pieces. [S65] Ancestry - various indices, Source Citation: Class: BT26. Source Information: Ancestry.com. UK, Outward Passenger Lists, 1890-1960 [database on-line]. Provo, UT, USA: Ancestry.com Operations, Inc., 2012. [S185] Property Titles. ; PROV (Public Records Office Victoria), C/T 2329-714 & C/T 2955-857 - Beryl Potter of Flat No 3 "Abercairn" 102 Toorak Road South Yarra Widow. [S185] Property Titles. ; PROV (Public Records Office Victoria), C/T 2329-714 & C/T 2955-857 - Mortgage No 807059 - discharged 2 Nov 1944. [S185] Property Titles. ; PROV (Public Records Office Victoria), C/T 2329-714 & C/T 2955-857 - John Bruce Chirnside Grazier and Frances Mary Chirnside Married Woman both of Upper Beaconsfield - joint proprietors - C/T 6722-218 & C/T 2955-857. 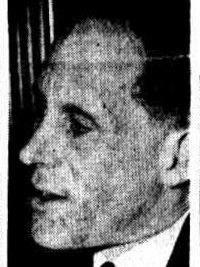 [S14] Newspaper - Examiner (Launceston), 10 Mar 1953, p9. [S14] Newspaper - Examiner (Launceston), 1 Oct 1918, p1. [S11] Newspaper - Argus 10 Sep 1938, p29. [S11] Newspaper - Argus 29 May 1943, p17. [S16] Newspaper - The Age 11 Jan 1944, p3. Marriage* 16 Jun 1944 Spouse: Illma Joan Rutledge. Christ Church, South Yarra, VIC, Australia. The bride, bridegroom and attendants, at the wedding of Sergeant Illma Joan Rutledge, AA.MWS, and Corporal Hugh Tulloch Potter (A.I.F.) all wore service uniforms. The marriage, took place at Christ Church, South Yarra, on Friday, June 16, and was celebrated by Padre McPherson. The bride, who is the elder daughter of Mr and Mrs H. J. Rutledge, Hare St., Echuca, was attended by Corporal Lorraine Bygate as matron of honor, and Captain H. Chapman was best man for the groom, who is the elder son of Mrs Potter, Upper Beaconsfield, and the late Mr G. P. Potter, Tullochgorum, Tasmania. After the ceremony, relatives and a few close friends were entertained at a wedding buffet tea at Amesbury House, Domain Road, South Yarra, where all the services were represented. The honeymoon is being spent in Melbourne, after which both bride and groom will return to their respective units. [S30] Nominal Roll, Australian War Memorial - WWII, http://www.ww2roll.gov.au/, Date of Birth 11 Feb 1922 ; Place of Birth FINGAL, TAS. [S11] Newspaper - Argus 5 Feb 1953, p15. [S11] Newspaper - Argus 12 Jun 1943, p10. [S14] Newspaper - Riverine Herald (Echuca, Vic. : Moama, NSW), 24 Jun 1944, p2.